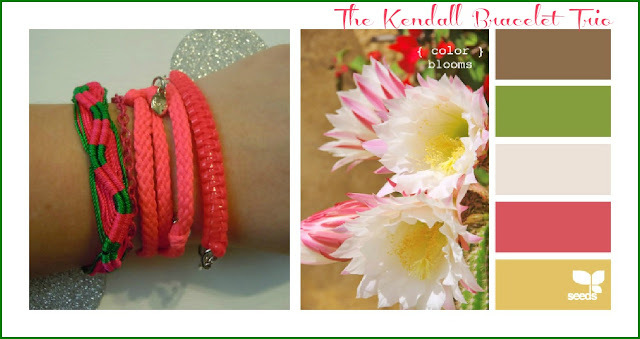 The Kendall Bracelet Trio is inspired by the bright pink hues of Summer, with a little bright green thrown in for contrast. It's watermelon lovely, and compliments the Color Blooms Pattern by Design Seeds nicely, I think. The bracelet trio retails for $25 and is available on Etsy & Storenvy. ♥Neon Pink Gimp Rexlace Bracelet on silver chain - 8"
♥Pink Braided Wrap Bracelet featuring a heart, feather and 'love stone' charms - 20"
♥Lobster clasps on each bracelet except for friendship, which is tied.